← Cake Disasters and Winner ! This weeks cloth was again a Harry Potter themed one. It was Elizabeth who had her name drawn out of the hat and Caoimhe before hand had helped her pic out her pattern and her colours. Elizabeth’s pattern is a Harry Potter Potions Cauldron. The pattern can be found HERE. Caoimhe chose for Elizabeth this black and pink combo and its very striking ! Again not a hope of getting it to block lol but she seems happy with it and that’s all that counts. This was done in an evening as so far this week I’ve just been to exhausted to stitch and when I’m tired I find it easier to concentrate on knitting. This head cold is lingering and I think its down to that ! Hubby has pulled the next name from the pot and its James. I will be moving away from black this week as I know he picked a red and yellow gryffindor coloured pattern, not sure exactly what is on the pattern. I am still reading The Missing by Tim Gautreaux, which has finally started to move on with the story. I can’t help put think that an editor didn’t do its job at the start of the book with several chapters being taken up with unnecessary slow moving info that could have been condensed and the reader would still have gotten the same info regarding the characters. Now perhaps that’s just me being picky but the first part of the book I felt to much time giving basic character background info that could have been accomplished in one chapter and the story could then have moved on into the meat of the story. I’m 20% of the way through the book and its only now getting into the main storyline ! I’m still flicking back to Heaven’s Wager. Ted Dekker’s style of writing is so much easier to follow and has a better flow, even though I still think I know whats going to happen its an extremely enjoyable read. I don’t want to give to much away as people may not have read it them or are going to. but I will do a total review at the end of each, these are just my thoughts so far. I have seen a few bloggers mention books by Beth Wiseman and Beverly Lewis. Amish inspired books. This subject I’ve not read about before so I was curious to find out more about it and after reading some reviews on them I will sampler a book by both and see what I think. Again any other book recommendations just let me know in the comments. This entry was posted in Uncategorized and tagged Harry Potter Potions Cauldron. Bookmark the permalink. What a wonderful knitted cloth for your son! You're a super mom! 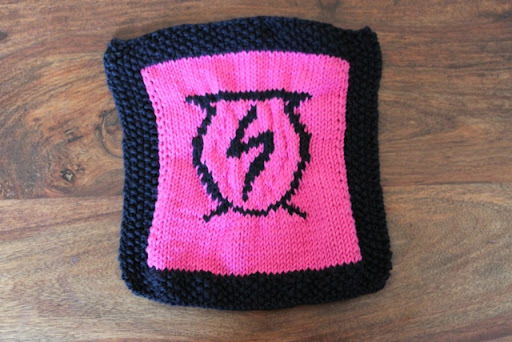 Another great dishcloth – your children must love them. Hope the book continues to keep you interested now – you've also got quite a list lined up to read too.Hope your head cold clears soon. I'm loving this and the whole HP series you're doing 😀 I wonder what will come up next! gorgeous cloth with such striking colours.